Closing the stable door after the horse has bolted is perhaps a somewhat overused phrase. Nevertheless, nothing could more accurately characterise the decision of the Syriza-led Greek government to impose capital controls and shut down the country’s banking system. The move was not made to take control of the economy, much less to begin the nationalisation of the banks, the financial system and major Greek companies. 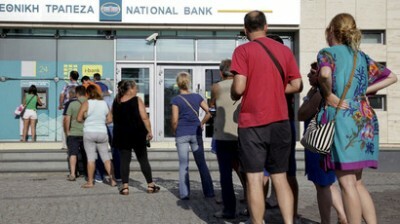 It was in response to a European Central Bank decision to suspend its funding of the Greek banks at the weekend. As a result, if the banks had opened this week they would have experienced a run that rapidly would have rendered them insolvent. Billions of euros, held by wealthy Greeks, as well as corporate and financial interests, have already left the country and are now safely parked in Europe and elsewhere. The owners of this cash pile have prepared for a situation where Greece exits from the euro zone and returns to the drachma. If that eventuates, the money can be returned and used to buy up land, companies and financial assets for a song, because a major devaluation against the euro would follow any return to a national currency. Some idea of the scale of this potential financial looting is provided in a comment by economics writer Wolfgang Münchau, published on the web site of the German news magazine Der Spiegel. In 2010, as the Greek financial crisis was emerging, deposits in the country’s banking system were just short of €300 billion. Over the past five years, they have fallen to under €175 billion. The decline took place in two stages. There was a decline of more than €100 billion between 2010 and 2012, when it appeared that Greece might be forced out of the euro zone. The level of deposits stabilised over the next two years as the Greek government entered the bailout program organised by the troika—the European Commission, the European Central Bank and the International Monetary Fund (IMF). A further outflow commenced at the start of this year, following the election of the Syriza-led government. The bailout program had nothing to do with alleviating the Greek economic crisis. Rather, it was a carefully contrived operation in which debts owed by Greece to private financial institutions were transferred to the IMF and the European Union. Of the more than €200 billion provided, an estimated 11 cents in every euro actually went to finance the operations of the Greek government. The rest was used in round-robin operations to pay off the privately-owned banks and financial institutions. The Greek people were forced to pay the price, via the imposition of an austerity program that led to the lowering of wages, the cutting of pensions and vital social services. The imposition of depression conditions has seen the Greek domestic product reduced by more than 25 percent. GDP data show that five years into the start of the crisis, Greece is in a worse position than the United States was five years after the beginning of the Great Depression of the 1930s. Even if the Greek economy were to grow at 2 percent a year—the average growth rate for Europe before the crisis of 2008—it would take 13 years just to return to the position it reached in 2007. This economic and social catastrophe was the driving force behind the election of the Syriza government on January 25 on a commitment to confront the austerity program of the troika and end the impoverishment of the Greek people. From the outset, Syriza, with its leader Alexis Tsipras and finance minister Yanis Vourafakis playing the leading roles, opposed the introduction of any measures against the dictatorship of finance capital. Reflecting all the political positions advanced by the pseudo-lefts in their hostility to Marxism, Vourafakis insisted that a socialist perspective was not only completely unrealistic, it would open the way for authoritarian and even fascist forms of rule. The Syriza leadership, supported by the various pseudo-left groups within its ranks, aligned with groupings such as the International Socialist Organisation in the US, promoted the illusion that it would be possible to secure debt relief and other concessions through negotiations and manoeuvres with the troika, while Greece remained within the euro zone. This perspective, which reflected the direct economic interests of sections of the Greek bourgeoisie and the petty-bourgeoisie represented in the leadership of Syriza, was based on two false premises. The first was that any Greek exit from the euro zone would cause such a degree of financial turmoil, directly hitting German and other financial interests, that the troika would be forced to pull back from the brink. This completely ignored the fact that the bailout operations had largely extricated the privately-owned banks and finance houses from the immediate impact of a Grexit. The second was that the government would be able to play off different sections of the European bourgeoisie against each other and that pressure from the Obama administration, anxious not to see a collapse in Greece and its potential adverse effects for American financial interests, would force the European bourgeoisie to change course. However, this assessment ignored one elemental fact of politics, long established by Marxist political economy. While various sections of the bourgeoisie may have differences with each other at certain times, reflecting the interests of the different sections of capital they represent, when it comes to confronting the working class, they join forces to fight for the interests of capital as a whole. So it has turned out. The driving force behind the intransigence of the German government, and its ability to win the support of the rest of the European ruling elites, is the recognition that the war being waged in Greece is only a phase in the continuing onslaught against the working class across Europe. Any wavering in Greece would have major consequences in the rest of the continent. Likewise, President Obama is aware that any backdown in Europe would have a significant impact in the US. The utterly false assessment of Syriza, based on the outlook of the social forces it represents, determined its actions from the day it took office. It made no preparations to meet the intransigence of the troika, declaring after each slap in the face that a negotiated outcome was in the offing with “our colleagues” in the EU leadership. Meanwhile, capital continued to flood out of the country. According to Münchau’s figures, in addition to the money that departed between 2010 and 2015, more than €50 billion left after Syriza took office in January. These figures, which cover bank deposits, are no doubt a substantial underestimation of capital flight. Corporations and the ultra-wealthy have many mechanisms for transferring money across national borders and placing it in safe havens, outside the official banking system. The Syriza-led government took no action to meet this situation, which was apparent from the outset, through capital controls or other measures. It neither sought to mobilise the working class at home, nor appealed to workers in Germany and across Europe for support. Rather, it allowed the dominant sections of the Greek bourgeoisie to ravage the economy and set themselves up for a financial killing should Greece be forced to quit the euro and return to a national based currency, or some hybrid system involving the combination of the two. Syriza has called for a “no” vote in Sunday’s scheduled referendum. This is not aimed at launching a fight against the imposition of financial dictatorship, however. As Tspiras has made clear, the bankrupt road of so-called “negotiations”—in reality the process by which Syriza accommodates itself to the escalating demands of the troika—will continue, with a “no” vote supposedly placing Greece in a stronger bargaining position. This orientation is not the product of ignorance or a failure to draw the lessons of the past five months. It is an expression of the class basis and orientation of Syriza and its leadership, which understands that a real struggle against financial dictatorship has revolutionary implications—an eruption of the working class from below. This is the prospect they fear above all else. The WSWS advocates a “no” vote. It has insisted, however, that this must be grounded on a revolutionary perspective—that is, the fight to take political power, through the establishment of a workers’ government that will seize control of the financial system and the major shipping and other corporations. Such a perspective can be realised only as part of an international struggle based on the mobilisation of the working class across Europe against the dictatorship of finance capital.